The weekly planner is your guide and resource to navigating your business through pregnancy and the first 6 months of your baby's life. Each week you'll receive encouragement, stories, and business exercises to prepare your business to take a maternity leave and return to work as a parent - calm and confident that you've got this! This training uses Asana to create a time management business system for mom entrepreneurs. We cover strategies to plan your day, map your goals, and capture your inspiration at a realistic pace that factors your business and family life. 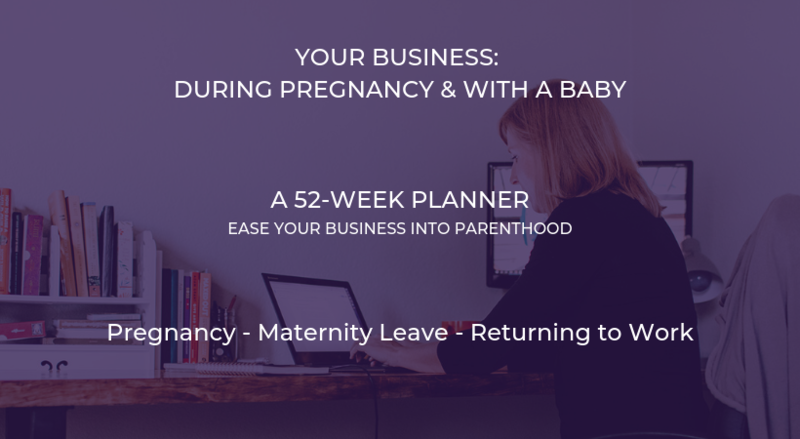 A laser focused support call (45 min) to determine and plan the best personalized maternity leave strategy for you and your business! A laser focused support call (45 min) to review your business, your desires for motherhood, and identify the business shifts you can make to align and realize your dreams in all areas of your life! Nesting Your Business Signature is a 6-month program to support you through the transition to running your business after having a baby. Learn how to run a thriving, successful business - confidently, calmly, and consistently - while also being a present parent, enjoying your new baby. Learn More Nest Your Business! You can learn more about our schedule of events here. Learn More I want to be a member! If you'd like to help spread the word about my services to your circle, you can sign up here to access affiliate links.